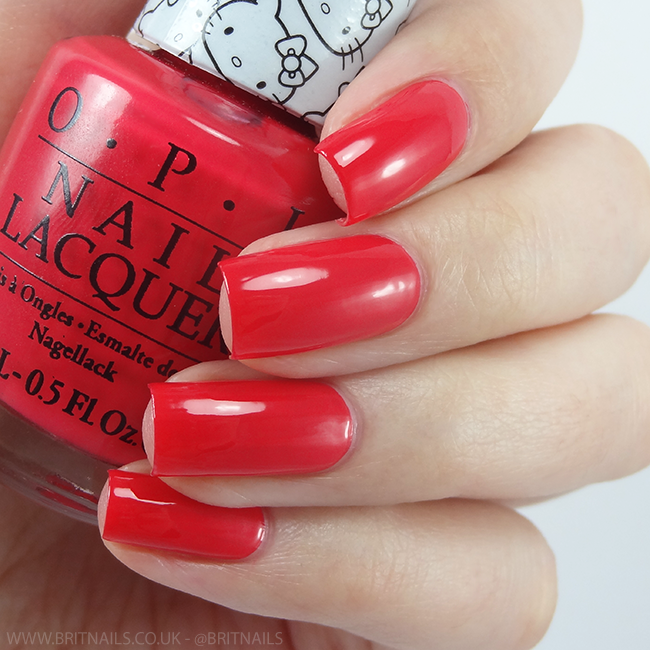 We're ramping up the cute around here today with some swatches of the new Hello Kitty collection from OPI which is hitting shops today! The collection consists of 6 limited edition polishes (which I'm showing you today) plus 6 salon-exclusive shades. They have the cutest lids I've ever seen! The 6 readily available polishes are all varying shades of pink and red, plus a glitter. The 6 salon exclusives are more varied and include a yellow, royal blue and black (no swatches of those, unfortunately) As usual with OPI there's also a mini pack of 5 shades available which includes an exclusive white polish and a cute nail art tool. Super Cute In Pink is a magenta toned pink creme/jelly (don't make me say crelly) this one appears quite sheer but builds up in 2 thick coats. Let's Be Friends! is a very pale pink creme. This was a tad streaky and needed 3 coats to even it out. I love the colour, but I don't think it suits my skin tone at all unfortunately. Charmmy & Sugar is the cute pink glitter to end all cute pink glitters. 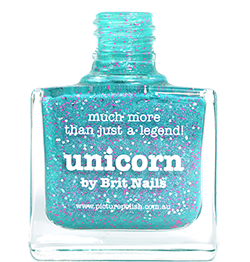 The base is clear with loads of frosted pink shimmer, plus tons of small hex glitter in pink, silver, green and blue. It's pretty dense but best worn over a colour - I've shown 2 coats over Look At My Bow. It's very cutesy and sweet and won't be to everyone's taste, but it's just so pretty I could look at the bottle all day. Although the colours are pretty basic (with the exception of Charmmy & Sugar) I am totally won over by the theme and the adorable stickers on the lids. Big fans of packaging here, as we know! What are your thoughts, do you like Hello Kitty or is it not your thing? I was going to get Pretty in Pink but I don't like that it's not a creme. I do like Spoken from the Heart in your swatches and Charmmy and Sugar. I would give the collection a miss but I am going to buy at least one bottle as Kitty is so cute on the lids. I actually think Let's Be Friends looks amazing on you! Such a cute set. When I first saw the collection I thought I would be bored because as you said it's so basic. Yet whenever I am looking for a specific pink in my collection I never have the right shade. That's my motivation for getting these because they're all such lovely colors (minus the glitter polish). 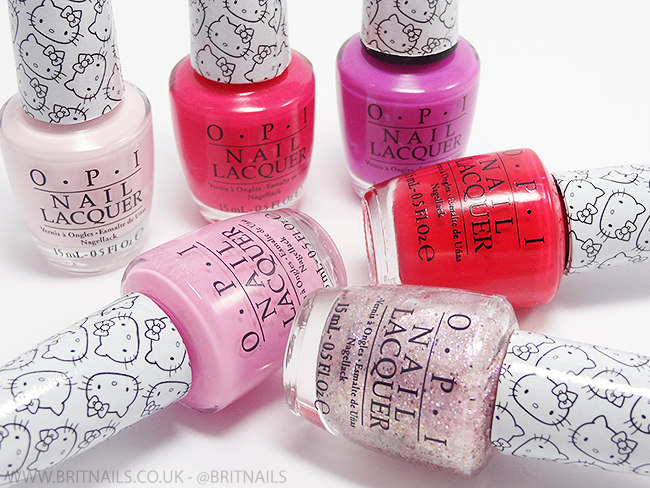 I think this is the cutest set, I'm not really into Hello Kitty at all, but the colours are lovely which makes it one of my favourite releases from OPI for a while, even that glitter is stunning! I adore that macro you've shown! Great swatches! As if I didn't already want these badly enough... it's making me sad that I don't have them yet! They are all so amazing. If this is any indication of OPI's style for the year, it's gonna be a great year! Loved the swatches! 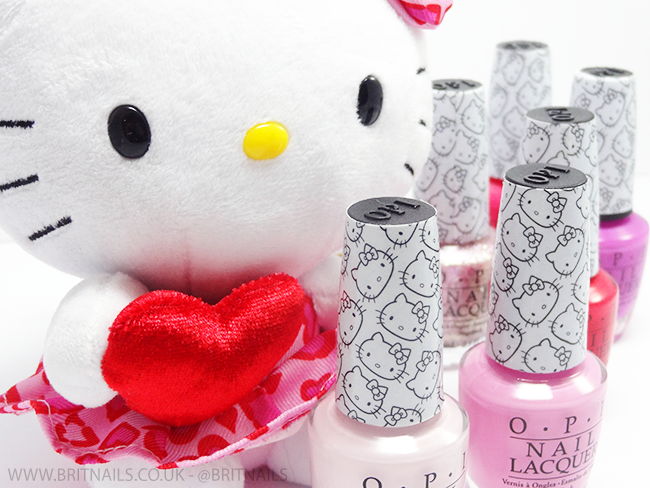 And these are so Hello Kitty!!! The colours and the amazing looking cremes!! I confess I'm not much of an OPI fan but these are such cuties!! I've been really torn about these, but I really do enjoy the shades even though they are pretty basic, as you said. The OPI fan in me also wants them for the packaging... Your swatches would win anyone over!